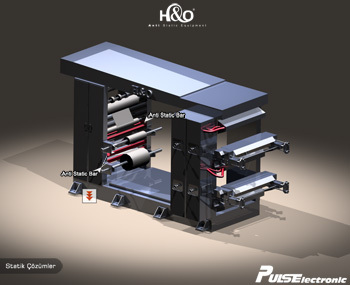 As soon as the roll-wrapped plastic film in the printing machines starts unwinding, the static charge begins to be charged and when the friction on the film rolls is added, a high static load on the film surface will be observed. Static charge on the surface drifts to the right and left on the film line, dust particles entering into the static electric field effect the surfaceo that print quality is decreased, the operator is exposed to electrical shocks, the electronic equipment of the machine are damaged and most importantly the static electricity is creating shocks. Accordingly, it may lead to serious problems such as severe bangs. Puls Anti static bars will allow the film printing cylinders to enter clean and static electricity free when applied bilaterally to the exit of the solvent unit as seen in the figure. Two anti-static bars placed at the entrance of the winder unit will be preventing the surface and equipment against static charges.